PISTOIA From Barcelona to Pistoia, travelling as CCTraveller to visit the Italian Capital of Culture 2017. Here is my story! 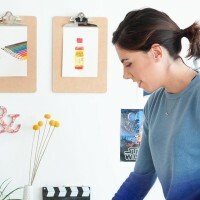 My name is Miriam Figueras and I’m an illustrator passionate about gastronomy. My stance on food is also that of an art appreciator and it is deeply influenced by my childhood memories. I love to think about food, to talk about food, to prepare food and to draw food quite shamelessly, I must say. As I got picked by CCT-SeeCity to be one of this year’s 50 Creative Curious Travellers, I was thrilled to finally get to visit Tuscany, a region that in my culinary mind had always been placed as a pivotal destination. I must confess that prior to this trip, I had never heard of Pistoia but I was eager to discover its specialties anyway. With surprise and immense delight, I came across many places to truly celebrate food, tradition and time, as I had never done before. Tuscany is a true feast for the eye in so many ways, I was aware of that. Pistoia is no exception. After a long day traveling, my first gastronomic encounter with the city happens in a narrow alley near Piazza della Sala where I have the chance to assess the famous quality and richness of its products. I have never seen such a delightful display of charcuterie delicacies like those served at Covo Bukoswki. Burrata, pecorino, prosciutto… and so much more. Some of the hallmarks of the territory. An immense sense of tradition seems to have prevailed along with natural and constant evolution. An extensive Medieval tradition can be found in the use of herbs and fruits. A culture sustained by the love of those who live here. That is the reason, I suspect, I’m really captivated by the people. A seasonal appreciation of earth’s products – in time with nature – and an incredible mastery of the specific cooking process for each one of them are the reasons why I believe Italians master the culinary art. That is precisely what I gather from visiting also I Salaioli (restaurant and shop) or la Taverna Gargantuà (their Tiramisù with “Cantucci e Vin Santo” is fabulous), also part of La Sala. 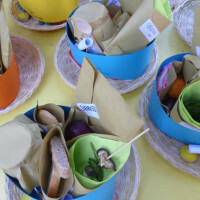 This group different establishments located at the heart of Pistoia have created together a great initiative that has brought identity to the city combining gastronomy, good-quality commerce and regular events. It’s fascinating for me to learn little by little about some of them and, certainly, get to taste some of their products and specialties. Toastone at La Saletta, artisan beer at La Degna Tana, “ricotta del pastore” at Bono di Nulla are simply some of the treats I enjoy on my numerous visits to La Sala. 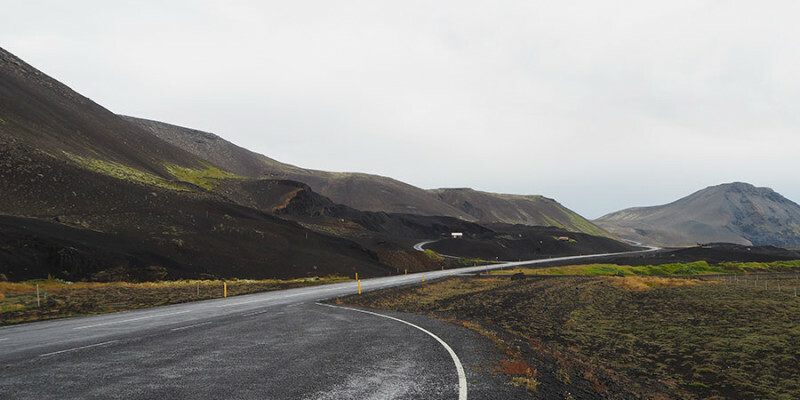 The atmosphere and local warmth is something you have to see for yourself… sigh. 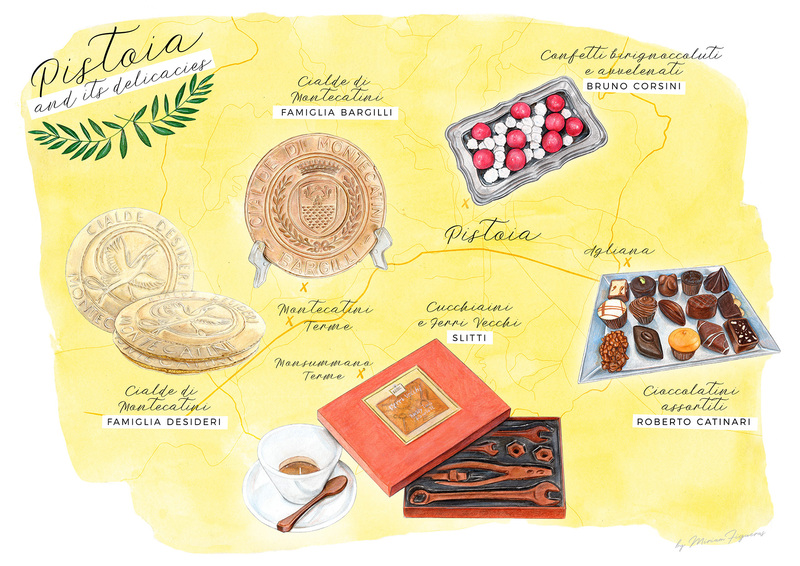 One of the most exciting experiences and, certainly, most rewarding for me is this sort of “sweet tour” – as we ended up calling it – around Pistoia and its province that I illustrate at the beginning of this post. Thanks to Elena, who accompanied me, we have covered by car a luscious area comprised by Agliana, Monsummano Terme, Montecatini Terme and, finally, Pistoia again. 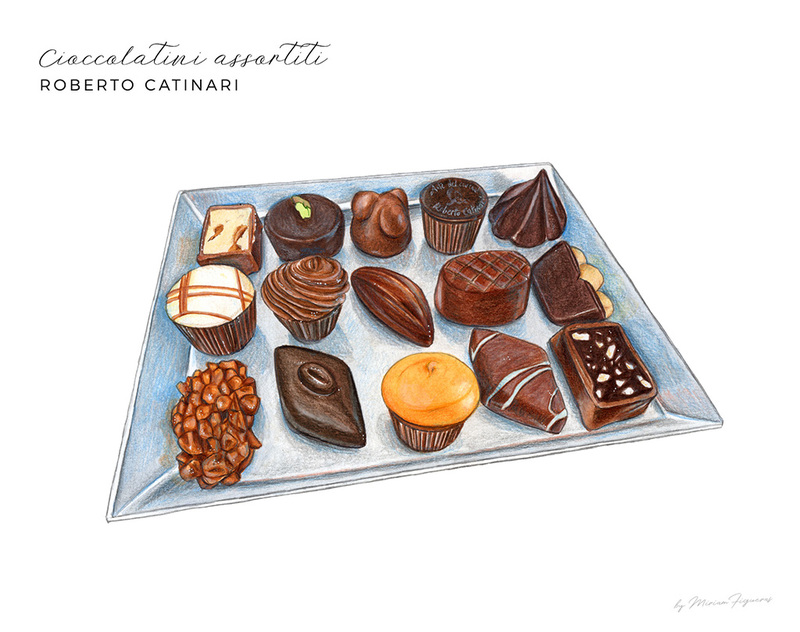 Our first stop is at Roberto Catinari’s store and chocolate factory in Agliana. A veritable institution in Tuscany, his quality and craftsmanship are legendary. He started in the seventies a venture then followed by other small factories that garnered this region the nickname of the so-called “Chocolate Valley” that runs among the cities of Florence, Prato, Pistoia and Pisa. As we are welcomed by Fabiana into the quaint and charming store, I can immediately understand such praise. Beautiful and deliciously assorted creations, lingotti di cioccolato (chocolate bars), schiacciate and even chocolate filled eggs are preserved in cool conditions from the scorching heat of summer. The visit to the factory is even more whimsical for me. Even though we are not in production season, which starts in autumn, we are given a full account of the magical process of turning cocoa beans, its butter and sugar, into luscious chocolate. The secret lies in the use of first quality ingredients – such as São Tomé’s cocoa – and solid technical knowledge. A precise change of temperature to 29.4o C gives chocolate its famous consistency and shine. Again, it is always a matter of “cottura” (cooking) and timing. I’m simply transfixed by all this information, the flavours and the subtleties of the art of producing some of my favorite treats in the world. That is a great start for one of the best and most intense days of my life. Back into the car, we drive towards Monsummano Terme and stopped by Slitti Cioccolato e Caffè, owned by Andrea Slitti. A disciple of Catinari’s, Andrea himself has achieved great success and worldwide recognition with his creations. Hasty and hot, we arrive to their boutique and nice café also filled with chocolate goods. Beautifully packaged chocolate boxes and ornate ancient coffee dispensers come first to my attention. It all started as a coffee-roasting company by Andrea’s father, we are explained. His sons, Andrea and Daniele, widened its production range to include chocolate. Aside from their assorted pralineria, two very special creations are not to be missed. 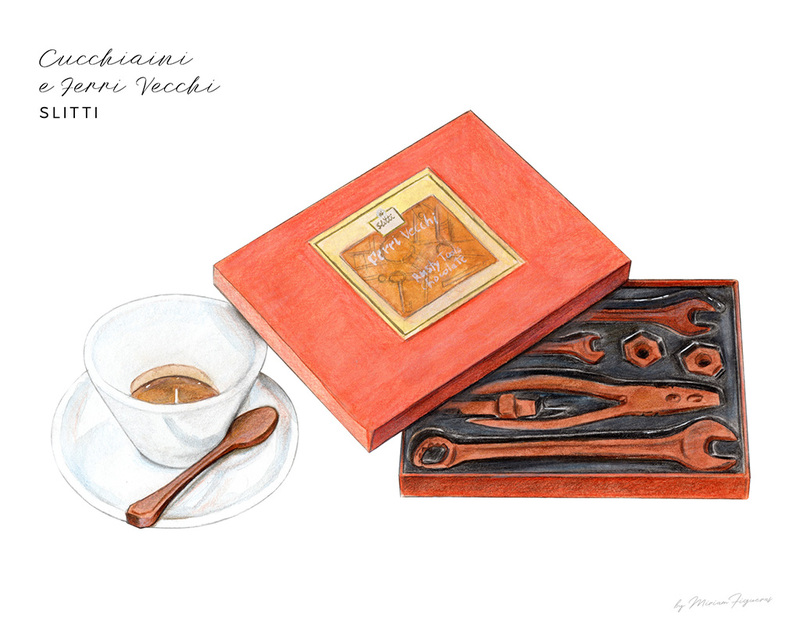 Made entirely out of chocolate, Slitti has accomplished to recreate the look and shape of real coffee spoons, “cucchiaini da caffè”, and a set of rusty tools, “ferri vecchi”. Very original and personal conceptions as, in the case of the tools, they were inspired by childhood memories. What an experience to stir my sugar in an expresso with a chocolate-made spoon! Another factory in this “Pistoiese Chocolate Valley” deserving to be mentioned is La Molina in Quarrata. No former preconception could have prepared me for one of the greatest discoveries of Tuscany’s sweet traditional production. Le Cialde di Montecatini are one of those culinary treasures deeply rooted to the territory. Montecatini Terme is a lovely town, famous for its thermal waters and also for these delicious artisanal biscuits consisting on two circular thin wafers filled with a mixture of almonds and sugar. They are yet another example of how top quality raw materials become a delicacy when skillfully treated. While touring through Montecatini, I can see how the spa town has retained its charm even if its golden days are gone. It’s like time travelling back to the 20th century. 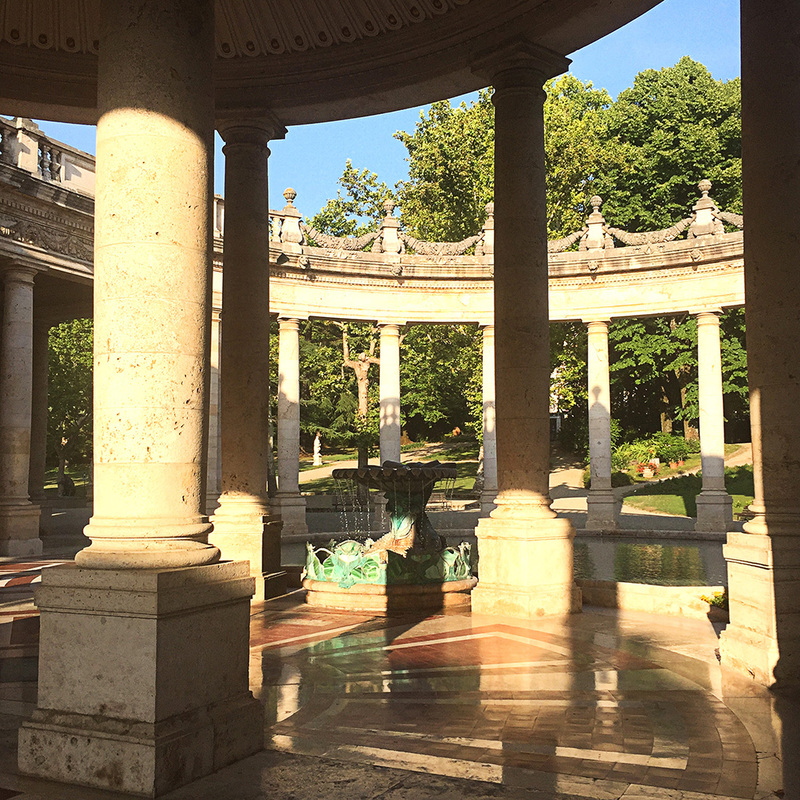 The Terme Tettuccio is a site to behold… fountains, decorative tiles, impressive colonnades and, if you are lucky, even live orchestra music. Impossible not to admire its beauty, somehow decadent and nostalgic, and be totally enchanted. After this pause, it’s time now to learn more about “le cialde” and other very local sweet specialties. Back on the road, we move to visit both Famiglia Desideri and Famiglia Bargilli, two family-owned businesses and keepers of this wonderful tradition that I was about to put my fingers, lips and heart on. 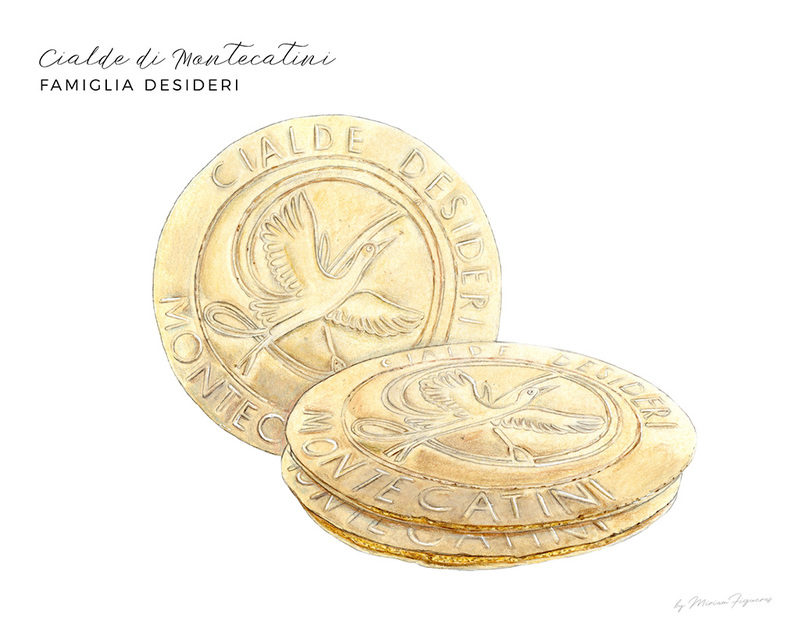 Giacomo Desideri kindly welcome us with a thorough demonstration and explanation of the process that entails the making of “Cialde di Montecatini”, thin delicate crispy wafers, and “Brigidini di Lamporecchio”, their initial specialty. Transmitted from father to sons to grandchildren, their activity dates back to the early 1900s. Originally from Lamporecchio, another town in the province of Pistoia and just a few kilometres from Montecatini, these particular puff pastries started being sold on ambulant street carts thus becoming a very popular treat at fairs and peasant festivals as they are still nowadays. 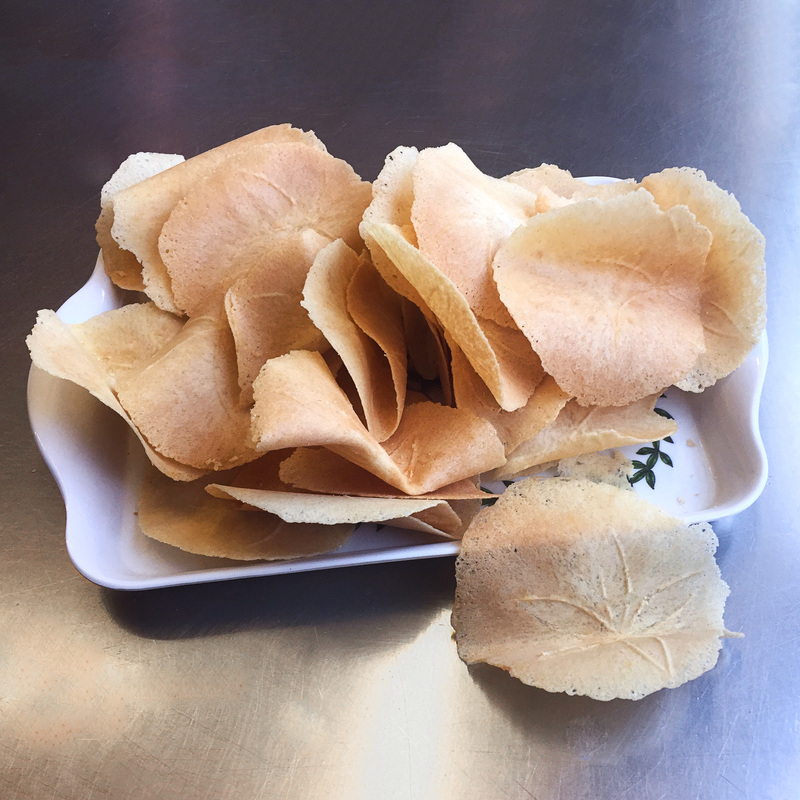 About 7cm of diameter, they are brittle and crunchy which make for great sweet snack. Made out of eggs, flour, sugar and aniseed, this family-company’s production has been improved by new machineries and especially thanks to their own prototype developed by Stefano Desideri. A carefully crafted and perfected production that always pays a special attention to its raw ingredients. No preservatives, just authentic flavours. I’m delighted by these precious products that deserve to be enjoyed with family and friends. Almonds are also the base for their production of “Cantucci di Prato” (traditional biscuits originally from the city of Prato) which here are also transformed into the “cantumatti”, incredibly tasty and crunchy puff pastry that reminds me a lot of Catalan “carquinyolis“ as I explain and show them with one of my previous illustrations. I believe we all felt so pleased for this wonderful commonality and it is a moment that I still affectionately recall. But let’s go back to Pistoia and its province, and precisely to Montecatini that has inspired the biscuit’s front design, consisting on a stylised bird and small frog silhouettes, a clear reference to the Heron and Frog Fountain by florentine sculptor Raffaello Romanelli (1925) we can find in the gardens of Terme Tettuccio. Their sensitivity to art is palpable, I also feel it by their keen interest in my work for which I’m deeply touched. Paolo Bargilli, his wife Maria and daughter Valentina, warmly greet us at the heart of their factory. Right at the entrance, we encounter a beautiful display of their base ingredients. Almonds, eggs, flour… A veritable reverence to the natural constituents of their confectionery business that started back in 1936 and has remained fundamentally unchanged. Gorgeous tin boxes and dainty ornate ceramic receptacles are also part of their visible tradition. It’s a joy to absorb their knowledge about the origins of “cialde” and “bridigini”, which they also produce. 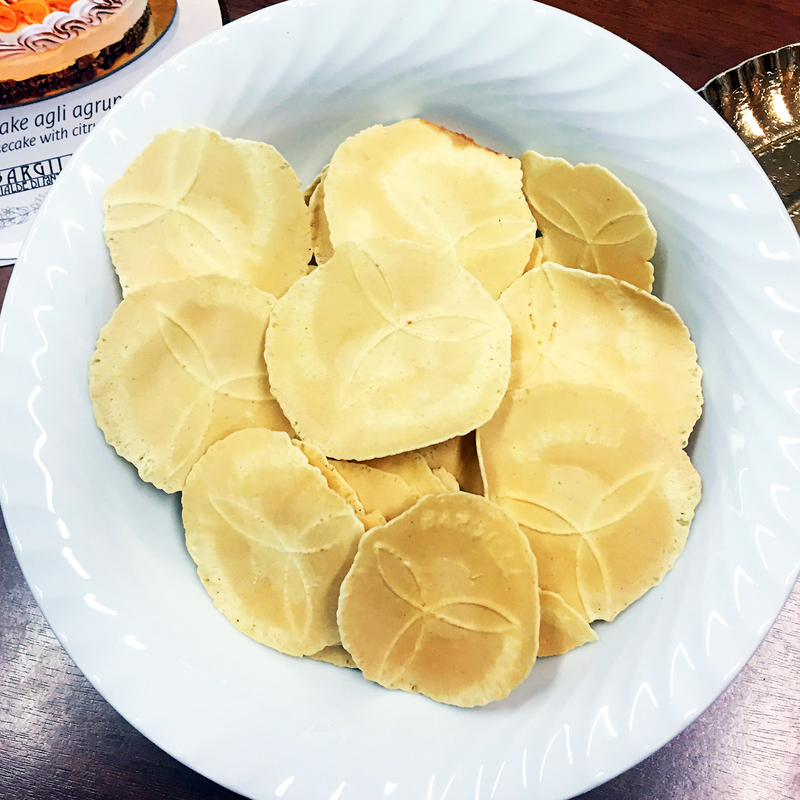 Precisely, the history of these thin popular pastries from Lamporecchio is particularly one of the oldest in the region, as Valentina kindly explain. 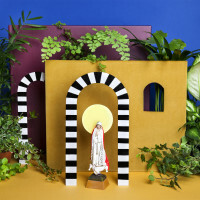 It’s generally established that the name comes from the brigidine, nuns of a local convent in Lamporecchio devoted to Santa Brigida that dates back to the 1300s. Their confection is exquisite and the result is flavourful. I can easily understand why they survived for so many centuries. I will never forget my conversation with Paolo Bargilli as he wisely elaborated on the gastronomic importance of cottura (cooking) and I – very inarticulately – discuss the differences between Spanish and Italian cooking. How he managed to understand me is still a miracle to me, yet one I will treasure all my life. As we get to taste their sweet products, we are reminded about the great balance of nutrients. The main reasons being its lack of any preserving agent, the total absence of butter or added fat parts and the use of almonds from Puglia. 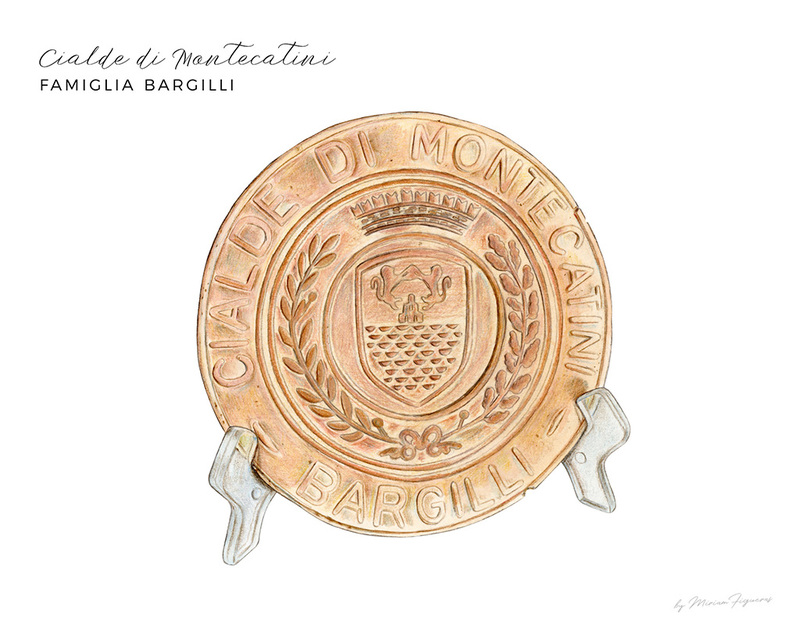 In their case, the top wafer of the cialde is decorated with the Montecatini’s emblem. Again, making its origin very present in this remarkable sweet creation. 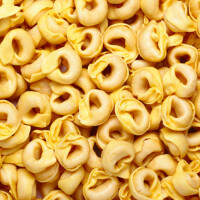 As I am told, they are normally accompanied with sweet wine, cut in triangles or served as a plate with gelato on top. 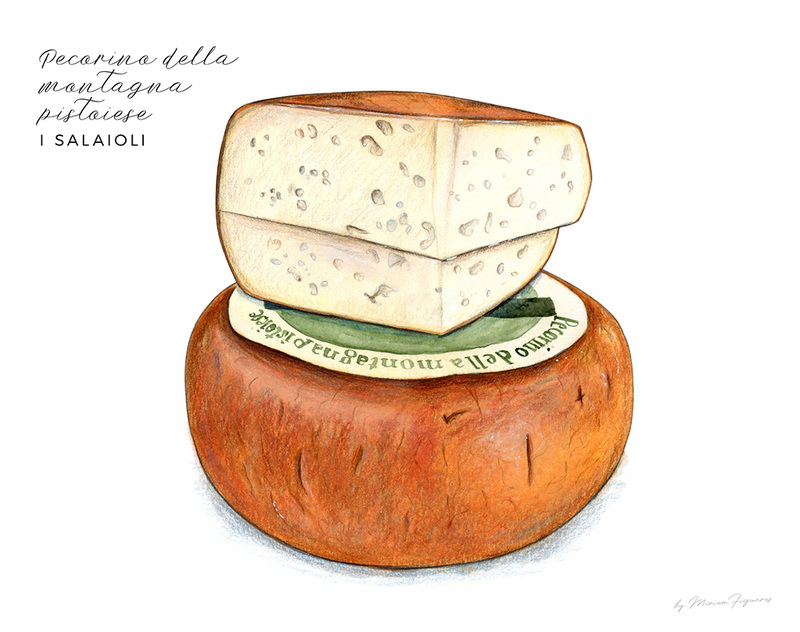 A delicious combination that Bargilli also offers at their local shop in Montecatini, near the central Pineta park. Who can resist Italian gelato? Unfortunately, during our intense tour around the province of Pistoia, we are not able to stop also in Lamporecchio where there is an important pastry shop: Pasticceria Carli, one of the few that still produces artisan brigidini and that makes the “berlingozzo”, a donut made with the same ingredients as brigidini but cooked in the oven. I will forever remember the generosity, the warmth and the profound wisdom of the craftsmanship that I’ve experienced in this special trip. 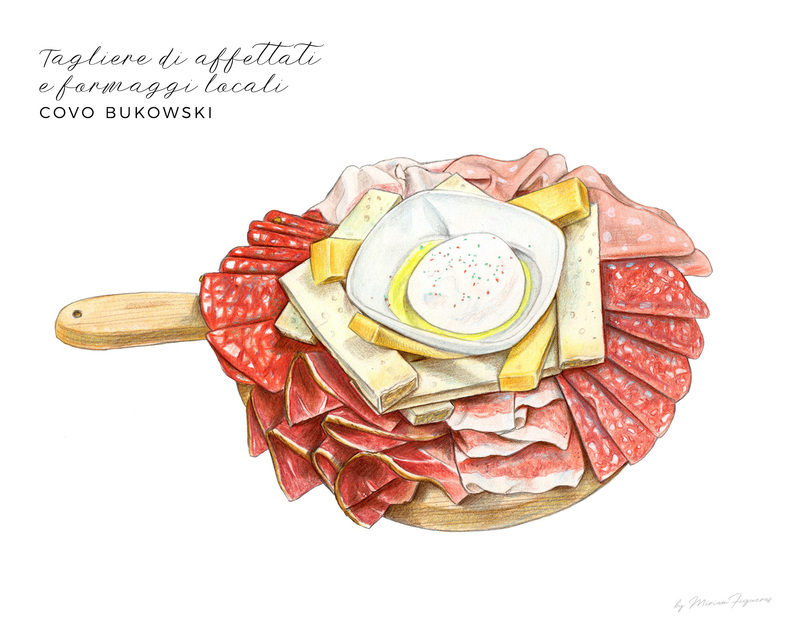 Being able to walk into their ‘laboratori’ and seeing firsthand how much they love and appreciate food is something that I feel my illustrations will never fully capture. Last stop of this sweet tour makes my return to the city Pistoia and my following awakening like a happy ending. In a singular workshop and store located in Piazza San Francesco (or Piazza Mazzini as local people commonly call it), we meet in the morning Giorgia Corsini, who continues her grandfather Bruno Corsini’s long traditional art of making gorgeous confetti. Originally intended as “digestive medicines”, they are now a symbol for many events, private ceremonies and popular celebrations. Once more, I recognise some distinctive traits of this region’s culinary richness that have been present along this trip. The masterly use of few raw ingredients of Medieval tradition and a precise technique to elaborate the most delectable confections. 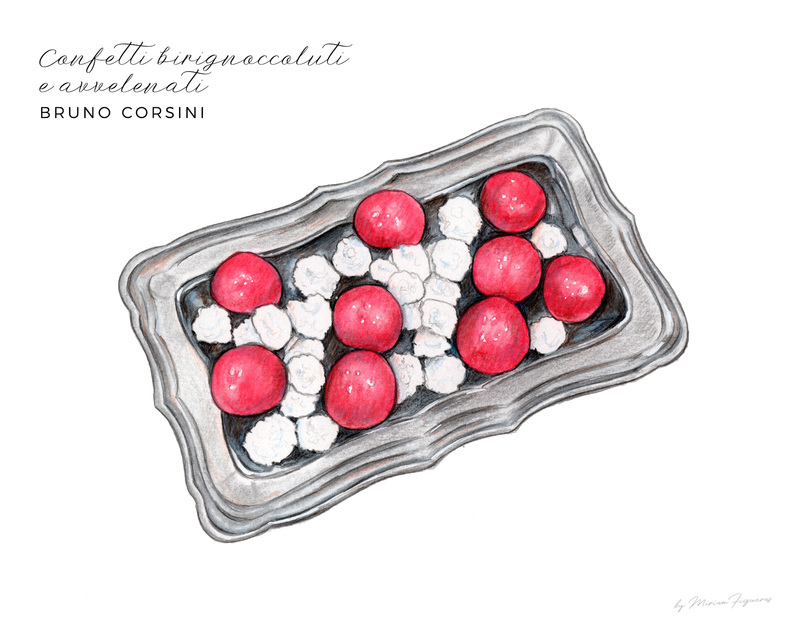 In Corsini’s case, sugar and water create a syrup that in big copper round recipients slowly cover a core – or “anime” (souls) – of almond, hazelnut, cocoa beans, chocolate or other fillings. A very local “confetto” is a white round sugar covered with many little characteristic ridges and exactly for its special shape is called ‘birignoccoluto’. Yet again, extreme expertise is required and conscious care and control of surrounding conditions such as temperature and humidity. I’m delighted to watch a little demonstration of the process and how these big lovely copper cauldrons make sweet magic happen. Along with these traditional copper receptacles, they also preserve fabulous antique chocolate molds as part of their confectioner’s heritage. Their production includes Panforte glacè, a traditional Tuscan spicy fruitcake with nuts (originally from the city of Siena) that here they totally cover with chocolate. However, there is one sweet specialty that Giorgia kept pointing out among her “confetti” for the curious story behind it: confetto ‘avvelenato’ (poisoned) is a lovely pink comfit filled with liquor but back in the XIV century was a murder weapon. Yes, you read right. That is the story of Filippo Tedici who gave a deadly confetto to his wife with obviously fatal consequences. He was then murdered (as traitor of Pistoia, for political reasons) and a sculture of his head can still be found in the frontage of S. Andrea’s Church in Pistoia, as well as in other places, to be publicly despised by people, as the legend tells. 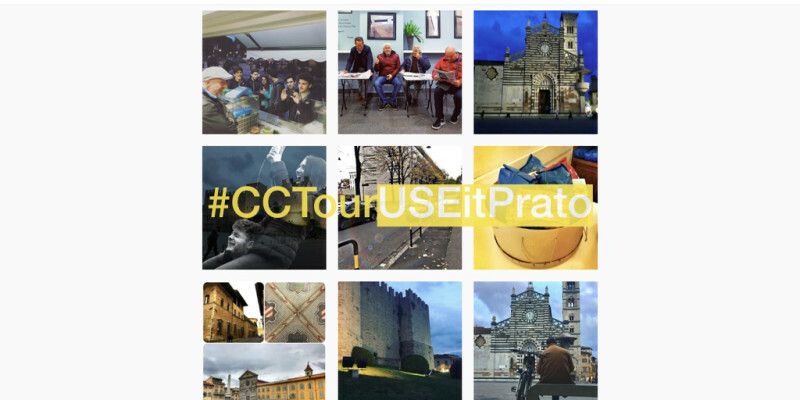 I can’t stress enough the value of Pistoia’s generosity, as I take this opportunity to thank again Elena and the CCTeam for everything I have experienced along with so many beautiful local people and other CCTravellers at this enchanting city and province. Everyone I met and everything I visited have left an indelible mark. People’s company and knowledge have enriched my journey and I hope to enrich yours somehow, sharing here my story. Per sempre, con me a casa. Grazie mille, Pistoia! Ah! 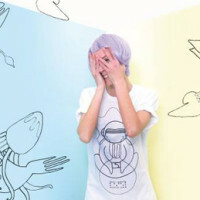 You can visit my website [miriamfigueras.com] and follow me on Instagram (@miriamfiguerascuadra).